It's no secret that I absolutely love books and will talk about them at great length to anyone that will entertain me with their spare time. I have been blogging about reading for quite a few years now and in that time I have amassed a ton of book blog post ideas, from things that I have already shared, to things that I would like to share with you in the future. Being the kind soul that I am, I thought I would share the wealth and pool 100 book blog post ideas for you all to get involved with. Whether you're a book blogger or not, these posts could prove to inspire new conversations in your very own spaces and encourage your communities to try something new so give them a go! 7 what are your favourite books of all time? why? 15 where do you read? show us! 34 share the biography of your favourite writer - what influenced them? 39 describe books in a photograph / drawing / sentence & get your readers to guess the book! 41 book apocalypse - you can only read one book or one author before the end of the world, what / who is it? 42 how do you organise your books? 43 go on a bookshop crawl - capture the experience! 57 how do you rate books? 63 what are you currently reading? 82 why do you read? 87 how do you feel about book snobbery? 89 should you separate the author from the work? 90 do you specialise in a certain area or era of literature? share your literary knowledge. 92 play the role of the author & rewrite a book of your choice. share what you would do differently. 93 unpopular bookish opinions - is there an author you can't stand that others love? 99 book wishlist - what are you hoping to buy next? 100 hold a blind date with some books - cover them up with pretty paper, write a bullet point list of descriptions that hint towards the books content and then get your readers to guess the books you picked out. 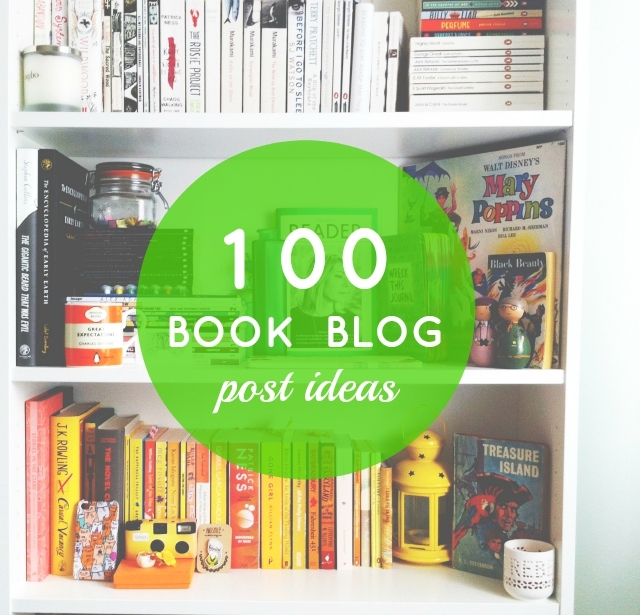 And now it's time to turn these 100 book blog post ideas into something more! Do you have anything else to add? It'd be great if you could share some ideas in the comments below. If this list hasn't sparked any inspiration, not to worry as I'll be back with another 100 book blog post ideas next month. Yup, that's right. 100 more. I'm going to drown you in ideas. If you've enjoyed this post, why not check out my other book blog posts? This is super useful! Thank you for sharing. I was literally just thinking about what posts I can schedule for the upcoming month. Voila! I love reading, but I'm always struggling how to write about them. I don't think I'm very good at reviewing and it's nice to have some other ideas for blog posts. Agh this is so great, thank you! This is a great blogpost! To come up with a hundred ideas... That's impressive! Thank you so much for creating this blog post! I've been stumped as to what to post in recent weeks and this has helped a lot! Great post! Definitely going to use some of these ideas in the new yeat, thanks! So many tags!!! I shall enjoy doing them! Thank you for the ideas! Thank you so much! I am just starting out and needed some ideas of what to do other than reviews all the time. This list is so helpful! Wonderful post!!!! So helpful, thank you! This post help me out, I was running out of ideas!! Thank you.